August Kickbusch should be remembered for his foresight, resourcefulness and intuition of Wausau’s promise. Born on Oct. 15, 1828 in Kolberg, Prussia (now Germany), August attended local schools, then serving an apprenticeship and working as a brick manufacturer for several years. He married Mathilda Schochow in 1854 and they had five children. August and Mathilda moved to in 1857, arriving in Milwaukee, via Quebec. Three days after reaching Milwaukee, August set off toward Wausau, walking about 200 miles. He purchased 354 acres of land to farm, but couldn’t access because it couldn’t be reached by wagon yet, so he returned to Milwaukee. August loaded up a wagon in 1860 with merchandise and drove again to Wausau, turning a profit of $59. He built a small shack on Clark’s Island where he started to conduct business from, which the family also lived in for nearly three years. In 1862, he purchased Edison Doolittle’s general store, which he turned into a grocery store that he expanded in 1865. Realizing his new town’s potential, August traveled to Prussia in the spring of 1867, recruiting 702 people to immigrate to Wausau, bringing the group to Wausau on June 20. Many of the new residents purchased land and began farming, with August hiring many to work for his businesses and helping others to find jobs. His plan and confidence in the area helped encourage more German emigration to the area, impacting the development of surrounding towns. August and lumber mill owner B.G. Plumer donated 80 acres of land to the Marathon County Agricultural Society in 1867, which is now Marathon Park. Their donation held an important provision that a fair be held there annually, allowing the organization the space to hold its September 1868. Officially changing from a town to an incorporated village in 1862, August served several terms as village president, and chairman of the county board for five years. Wausau was incorporated as a city on March 18, 1872 and August was elected its first mayor for a one year term on April 9, 1872, and served another one year term in 1874. August grew his businesses to include brick manufacturing, lumber mills, a feed store, and more, eventually becoming the A. Kickbusch Wholesale Grocery Company, including warehouse facilities. August’s efforts and promotion of the area persuaded the Wisconsin Valley Railroad to be the first railway to reach Wausau in October 1874. Mathilda passed away in 1891. August wed Amelia Flohr, with whom he had two children, Paul and Alma. 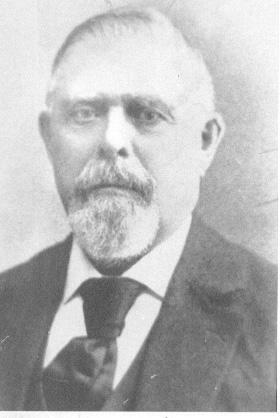 August was still active, serving as president of the George Ruder Brewing Company, director of the Wausau Furniture Company, vice president of the First National Bank, and president of the Central Land Company. Laying a foundation and anticipating the future, August Kickbusch’s effect is all around us — in enterprising business owners, a dynamic local government and a vibrant community — thanks to his vision and care of what the Wausau area could be.